Well howdy there everyone!! 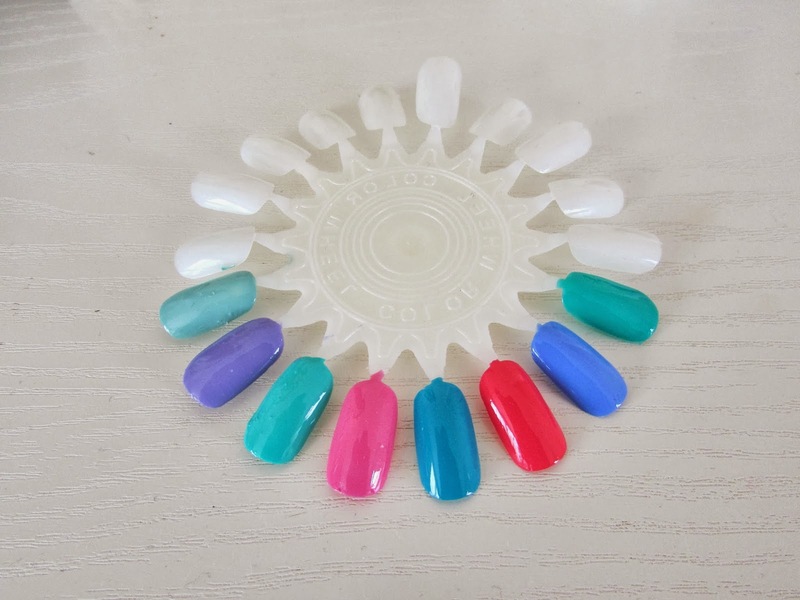 As the sun is still shining down on us and it's still incredibly warm out there, I thought why not do a final summer themed post and talk about my favorite summer nail polishes of 2013. I have been dying to do a nail post on my blog for so long now but my nails are not in good condition as I tend to bite them a lot. Yes I know...horrid habit. Because of this I decided to purchase a few nail wheels on amazon which were only around the £1.50 mark and included free delivery for a pack of 10 which I thought was amazing. They aren't the best nail wheels in the world but for the purpose of blog posts they will do so definitely go and check them out if you're in the need of some. Anyway enough rambling from me. One of my absolute favorite nail polishes to wear over the spring/summer period was Essie's Mint Candy Apple which is a gorgeous mint (how strange) pastel green color. This polish has been so highly rated within the beauty community so when I spotted it in Superdrug I didn't hesitate to purchase it. You definitely need two to three coats of this nail polish as it is very streaky on the first coat but it leaves an absolutely gorgeous finish on the nails once applied fully and doesn't chip that easily either. Gorgeous shade for the Spring/Summer seasons. I apologize for how badly it's come out on the nail wheel above as it is definitely more of a minty pastel greeny blue color. Summer 2013 also introduced me to some of the best drugstore nail polishes you can buy in my opinion. They are the Barry M Gelly Hi Shine Nail Paints. Barry M has always been one of my favorite brands to buy nail polish from as they are super cheap, have an amazing variety of colors, they are easy to apply and dry super fast which is quite surprising as they have quite a thick consistency to them. As you can see from the photos above I went a little crazy and got quite a few colors. Prickly Pear, Greenberry, Dragon Fruit, Guava, Grapefruit and Blueberry. All of which are gorgeous bright spring/summer shades. My favorite thing about this nail polish has got to be the fact they are super super shiny and they don't chip easily as well. I have bought a few autumn/winter shades from the Gelly Hi Shine range so look for reviews on them in the future. My last favorite spring/summer 2013 shade was from top-shop Now I never really shop in Top-shop as I really don't think their clothes are worth the price they are but I stopped in there one day to look for a bag and I spotted this gorgeous green shade and I feel instantly in love. Such a gorgeous bright mint/teal green shade. Like with the Essie nail polish it needs a good few coats in order to get a really nice overall color but once it drys it is gorgeous and lasts for a good few days. I love the size of this nail polish as well as the bottle isn't too big so it takes ages to finish, but it isn't too small so you forget about it either. It's definitely a good polish for popping in your make up bag if you are on the go. So those were my favorite nail polishes during Summer 2013. I will be honest and say yes I probably will be wearing these colors throughout Autumn/Winter especially if I'm wearing a dull outfit to just add a pop of color. Why not? What have been some of your favorite nail polishes of the summer 2013 season? I love topshop and Essie nail polish, I think they're such good quality and come in a range of colours! I haven't actually tried any of the Barry m gelly ones so I'm definitely going to try them out now! This essie and topshop polishes are the only ones I own from each brand haha! Definitely need to try more colors. But yeah try the barry M gelly ones. They are fab!! I've never tried Barry M polishes but I'm dying to. I think that their colors are b-e-a-utiful, plus they have a super nice finish. Great choices!